Brides are you looking for something extra special to amp up your wedding decor? Consider using Hanging Decor! Hanging decor can consist of greenery, paper, glass, flowers or just about any grouping of objects you like. This type of decor works well when you have a large quantity of items. Say your guy loves vintage watches, well you can easily incorporate that element for him. But, hang just one pocket watch and it would look weird swinging around over your groomscake table, right? But hang a group of old-time pocket watches and you look like the coolest design maven ever. “How did she think of that?” your guests will exclaim to one another as they admire your ingenuity. Fabric makes wonderful hanging decor elements. Swag swaths of chiffon to construct a billowy canopy over your tables. Wrap chandelier chains in ribbons for a sophisticated look. Or, suspend a bunch of ribbons, vertically, from the ceiling for a colorful and whimsical display. Looking to go ALL OUT? Then we suggest transforming your wedding reception venue’s ceiling into a dazzling display with hanging branches, floral decor and/or chandeliers. Or, achieve a simpler, but equally pleasing style aesthetic by hanging glass bottles with single stems and string. These bottles can be collected from dollar stores, craft shops, thrift stores and flea markets in the months before your wedding. So sweet! We love the tried and true, typical hanging decor like paper lanterns, paper fan decorations and hanging tissue paper flowers. Especially when you put a ton of them together. Yeah, it’s been done before, many times, but that’s because it WORKS. Paper lanterns are festive, fun, and light-hearted. And, affordable. Such an easy way to impart major chic to your space. These items come in every color under the sun so they can add to any wedding color scheme. Joyful never goes out of style! String some flowers upside down for some serious style impact. A simple assortment of stems can be utterly transformed just by hanging them upside down by their stems. See? Floral elements look even cooler hung in combination with geometric shapes. Including lighting with your hanging decor can amp up the amazingness, especially for evening weddings. A multitude of twinkle lights hung vertically in a tree is utterly stunning. Lanterns strung up with jute rope and adorned with lush flowers dress up a tree. Hanging glass orbs with candles add a glamorous dose of romance! White paper flowers on fishing line are an inexpensive and simple design solution, plus they aren’t going to wilt. Have your bridesmaids and family help you make up tons of these puppies ahead of time. Sewhistorically.com has a great tutorial here for making white jasmine flower garlands. Best part? You don’t even need any glue! For the wedding hang them up in great quantities for a lovely look. 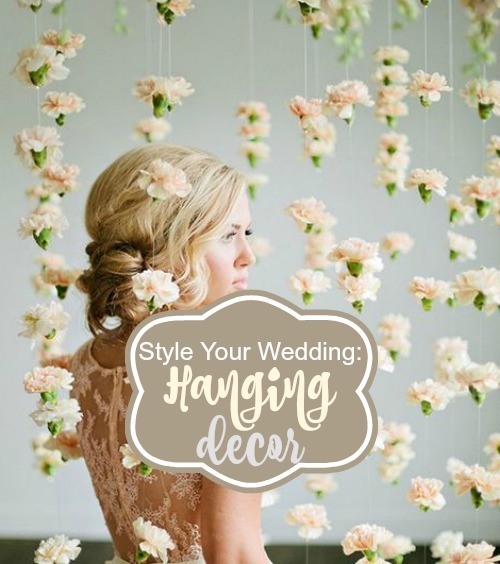 Whatever style you want to convey at your wedding, you can easily incorporate some hanging decor to bring it! No need to get hung up on what to do, just use some creative and gorgeous hanging wedding decorations. Wedding bells will be ringing!